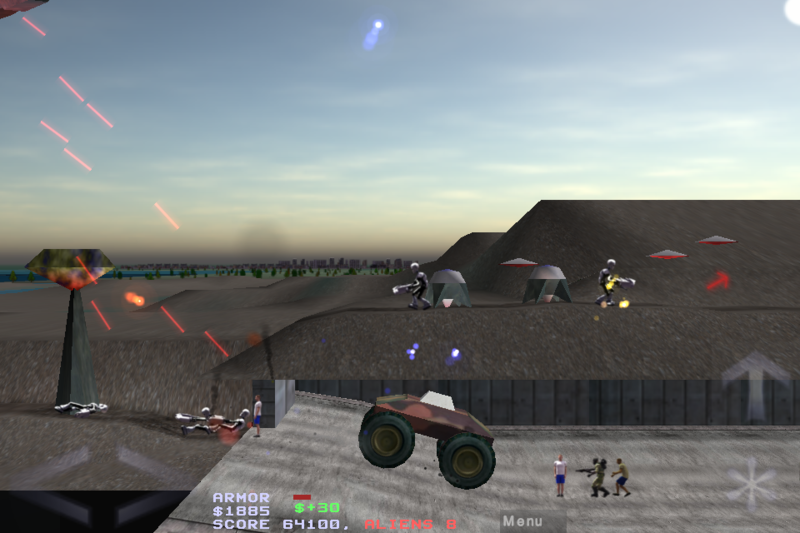 nVade is an action game for the iPhone, iPod Touch, iPad and Mac computers. 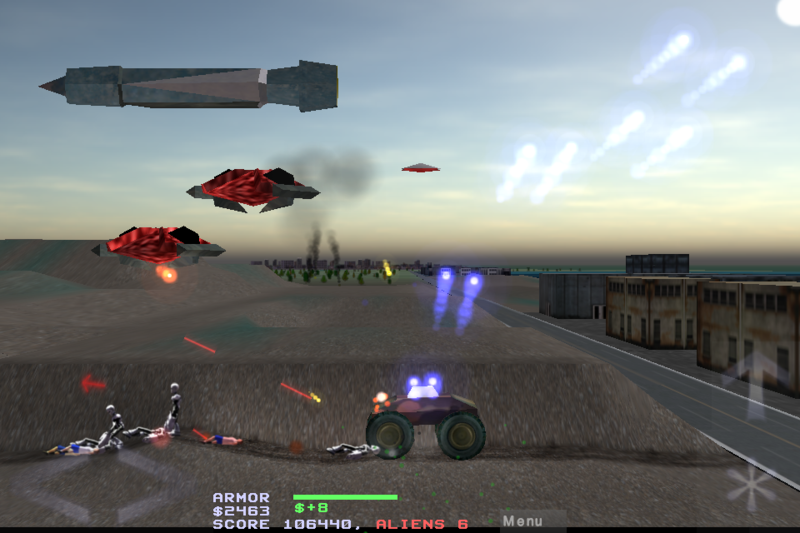 Soldier, ever run over an alien at 80 mph? Well now you will and boy do they bleed! The Grays have arrived and their invasion has begun! 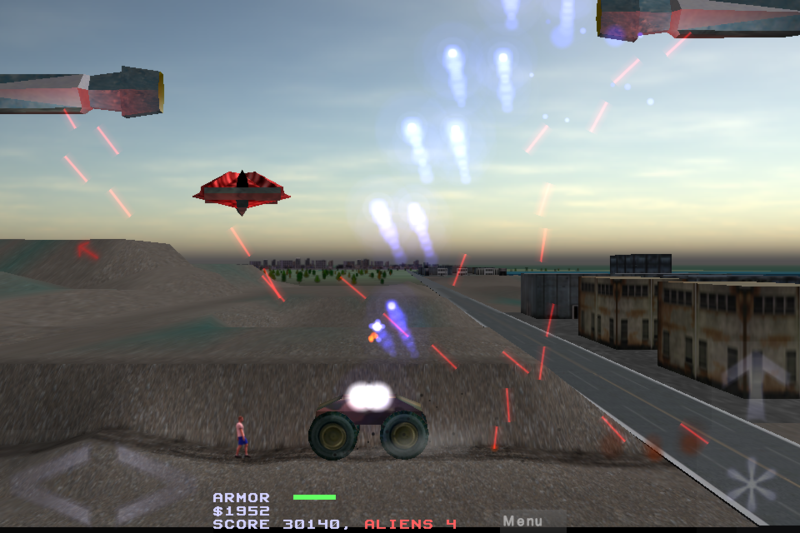 You will blow them out of the sky and off the earth with a variety of lethal weapons using EDF combat buggies. Buggies? Yep, these will smash a tank and keep on rolling. You will be cleaning off the goo for weeks! Now move! At 0400 EST a hostile force attacked cities around the world. These were later identified as a race of aliens we are now calling 'Grays'. They appear to be looting and abducting people for reasons yet unknown. EDF forces are on highest alert and the Grays are being met with our full capabilities. 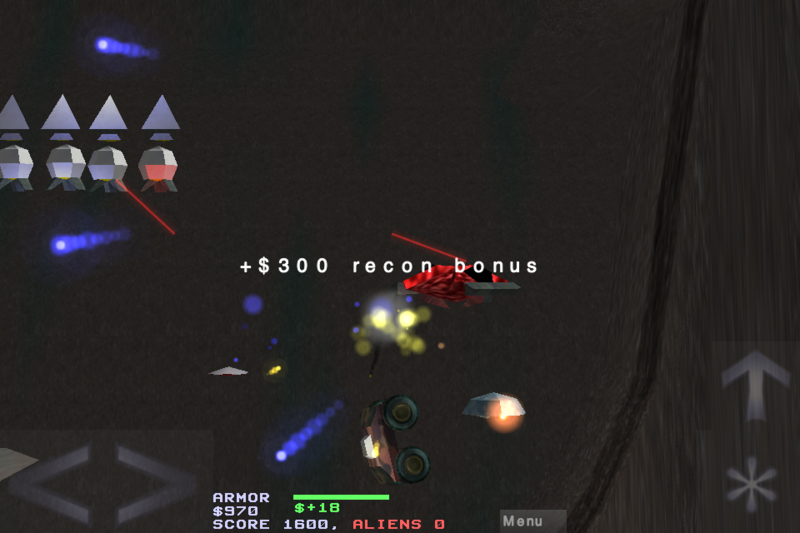 Use your assigned resources to kill all aliens encountered. Successful kills will reward you with more money. Run out of money and you will be reassigned to the morgue. You will purchase a vehicle when the mission starts. When the vehicle is destroyed, you can buy another. 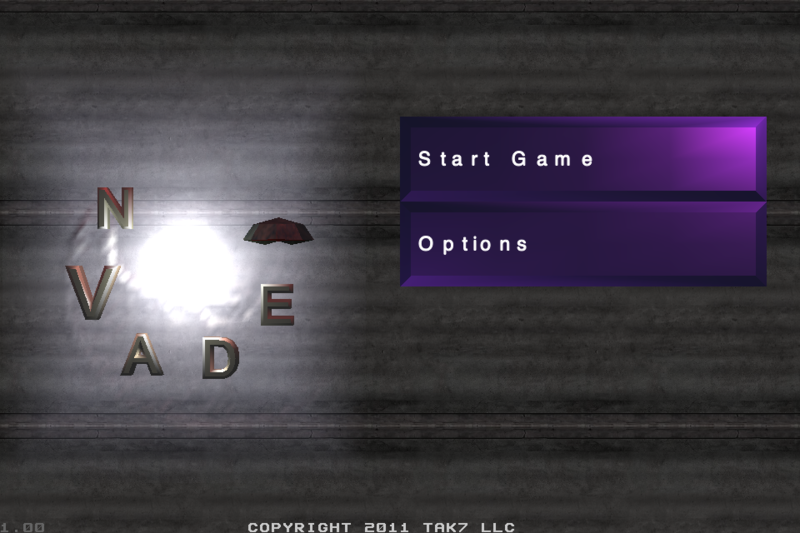 Some missions will contain a store. Drive your vehicle into the store icon to open the store. There you can repair the vehicle or sell it to buy another type. 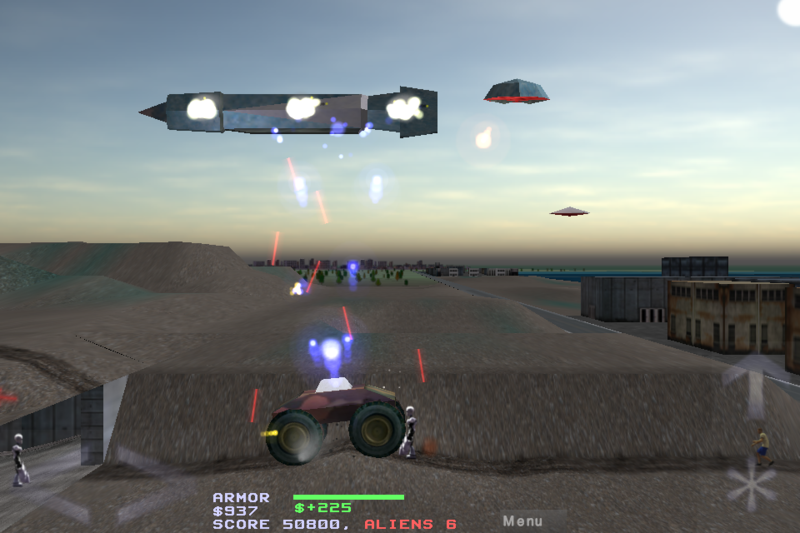 If aliens get near the store, they will attack it, which will cost you money. 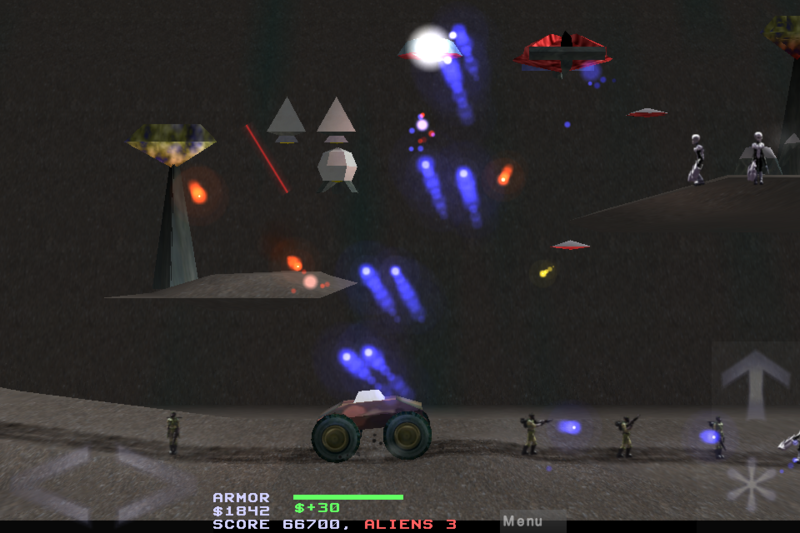 The aliens will attempt to land their ground forces using drops ships and landers. You will have a few commandos to assist with ground forces. Reinforcements will arrive if they die. Civilians will be present in some areas. 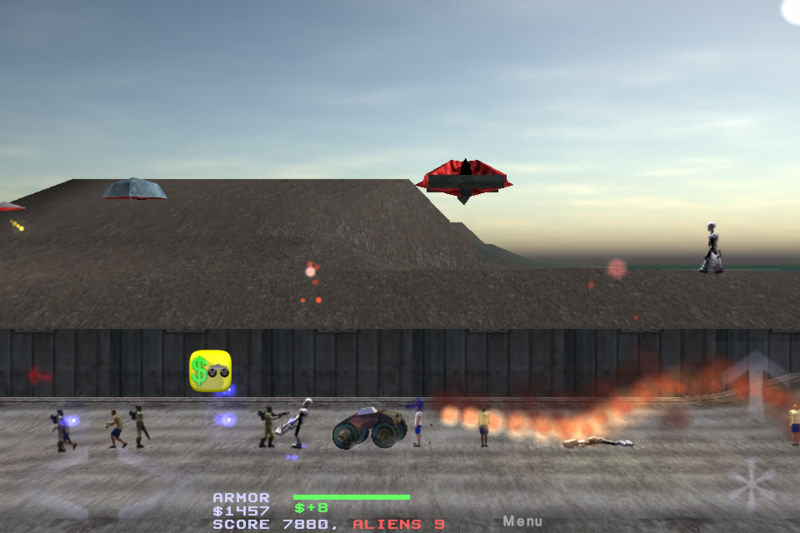 The aliens do not seems to be killing them, but they can die if caught in the cross fire. Commando or civilian deaths will cost you money. 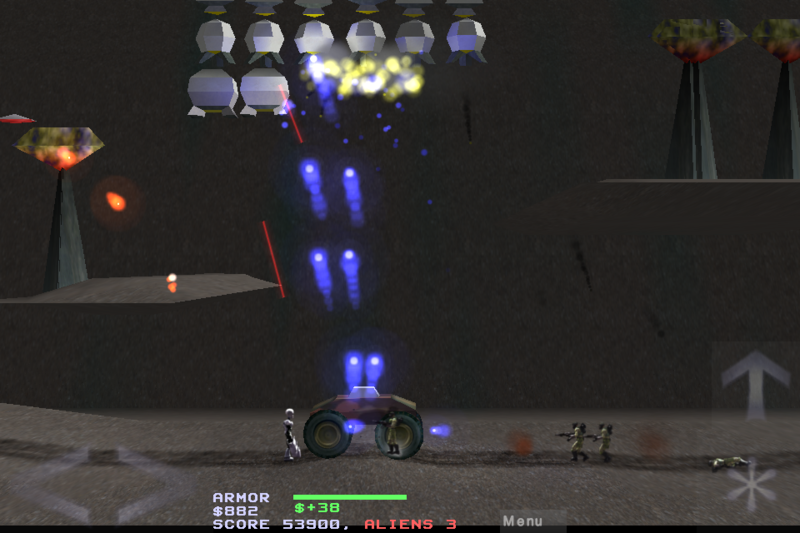 Landers will descend in groups and when they reach the ground, will deploy alien troops and plasma towers. Drop ships will release drop pods that also deploy ground troops. A red arrow will point to any lander groups detected. 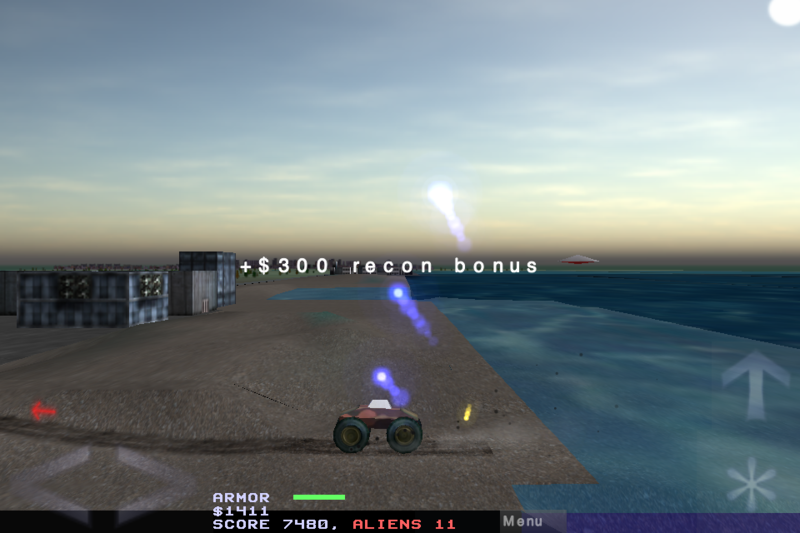 Vehicles are controlled using the buttons on the screen. Touch the left or right arrows to drive in that direction. The * button fires your weapons. Many weapons have high rates of fire, so tapping rapidly in short bursts will deliver heavy damage. The up arrow will activate the jump engine to clear obstacles or avoid fire. The engine will only activate if the vehicle is near the ground. 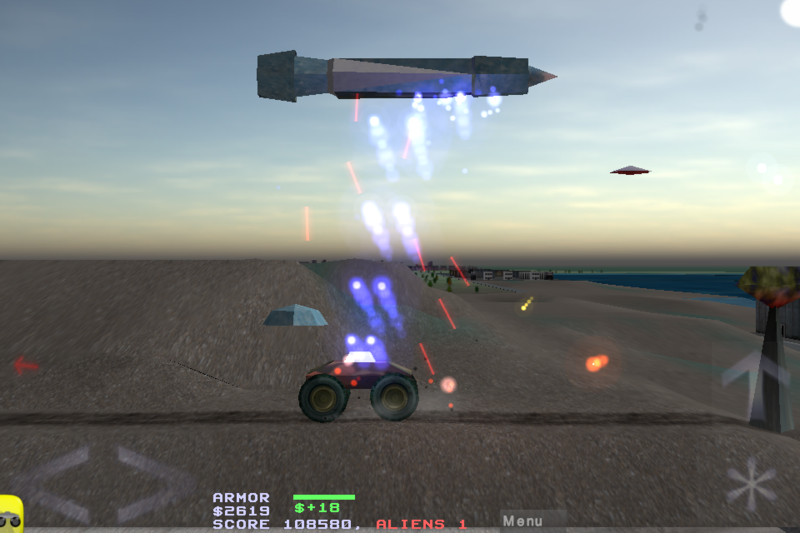 The ground weapon of choice for the EDF is the combat buggy. These are armored four-wheel drive all terrain vehicles that come in many sizes and can carry a variety of weapons. If you see a blue arrow next to the vehicle, you can aim the weapon. Touch around the vehicle to aim in that direction. 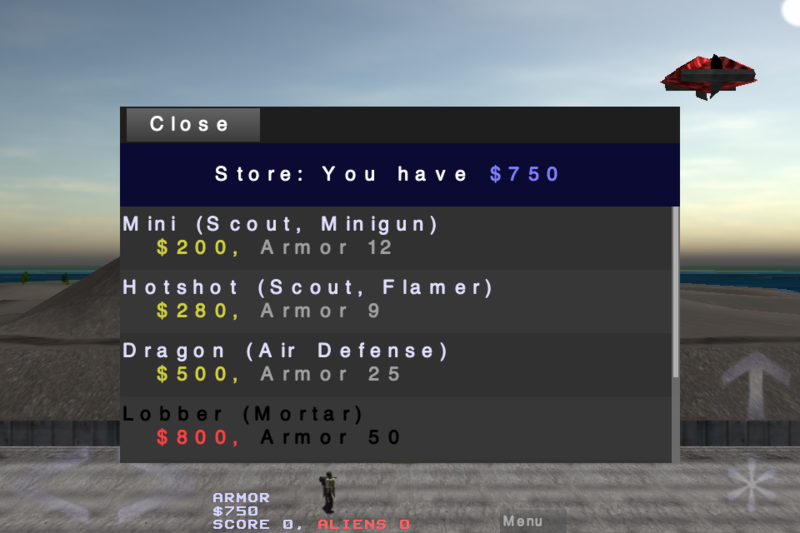 Mini (Scout, Minigun), $200, 12 armor. 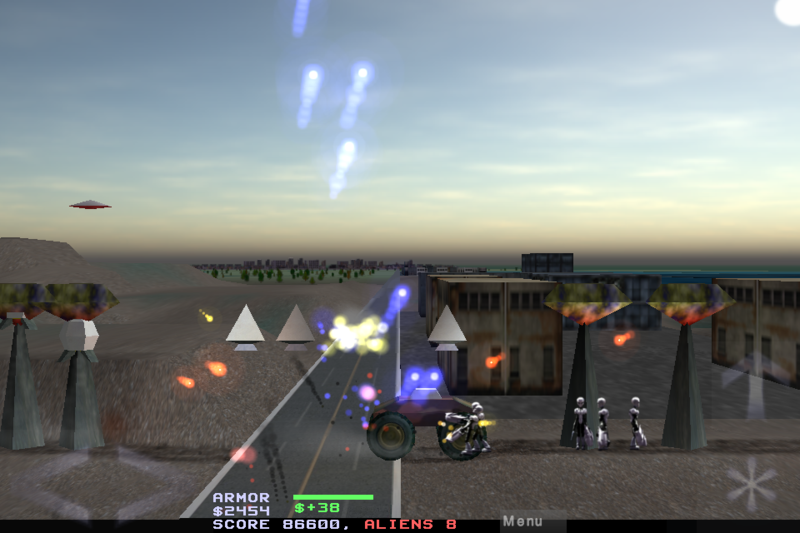 Very fast moving with a rapid fire minigun that can be aimed in 5 directions. Effective against infantry at range. Hotshot (Scout, Flamer), $280, 9 armor. Very fast moving with a flame thrower that can be aimed in 5 directions. The flames cause high damage to groups of infantry. 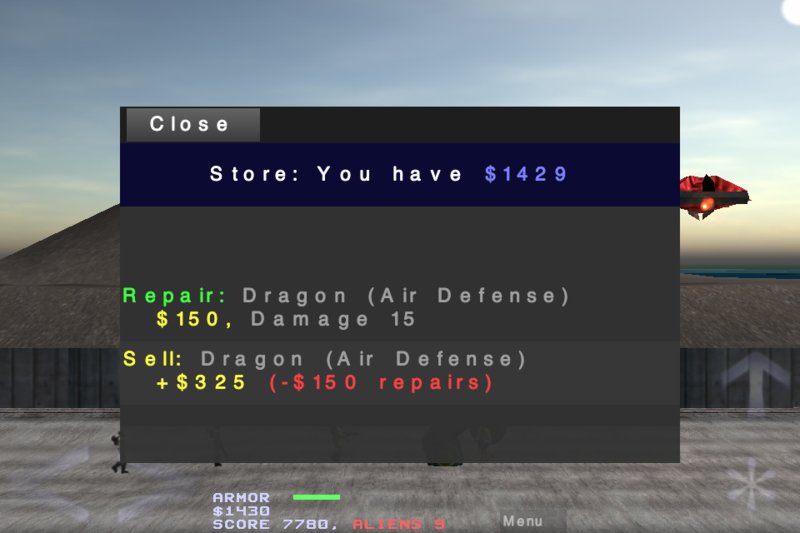 Dragon (Air Defense), $500, 25 armor. Fast moving with a plasma cannon that fires vertically. High damage against armored targets. Lobber (Mortar), $800, 45 armor. 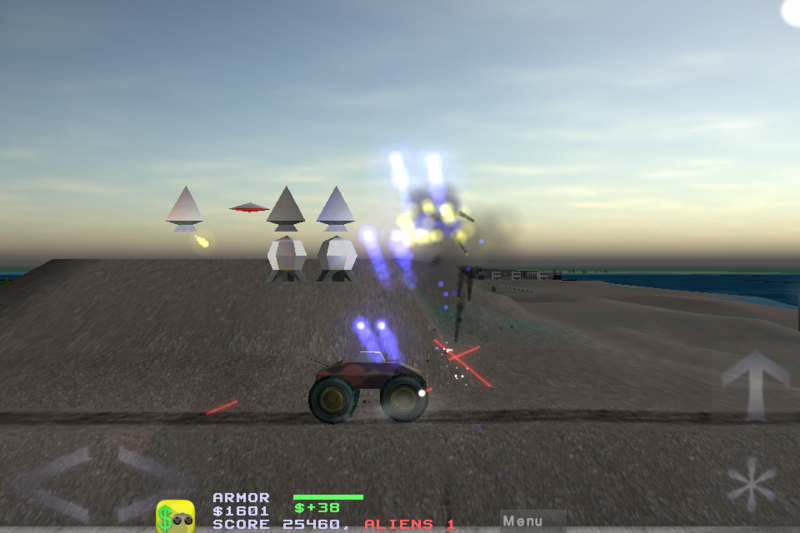 Moderate speed with a rapid fire mortar that can be aimed diagonally left or right. The camera tracks the first Mortar shell fired and then the next one and so on until they have all detonated. This makes it a tricky weapon to use, but it does do a lot of damage at range. Monster (Air Defense x2), $1200, 75 armor. Moderate speed with dual plasma cannons that fire vertically. High damage against armored targets. Excels at destroying landers. Maximo (Air Defense x3), $2500, 100 armor. Slow speed, but very tough with triple plasma cannons that fire vertically. 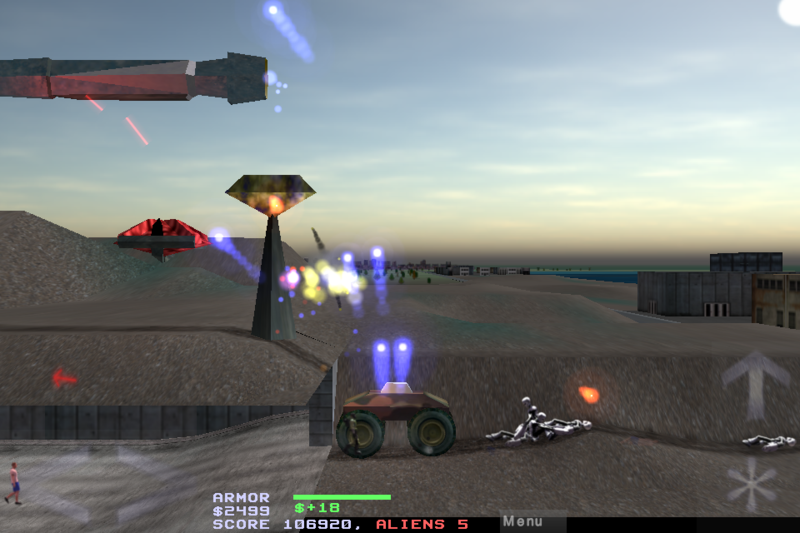 The center cannon is slow firing, but does massive damage and eats enemy plasma shots. Very good at destroying drop ships and towers.